Since ancient times, eating has been a communal business. We celebrate with food. We use food to mark significant cultural occasions. We re-group at the end of the day and share a meal along with our news. In recent times, however, there are so many demands on our time that the family meal is no longer the institution it used to be. Some research conducted in the UK a few years ago found that 10% of families never sat down to a meal together, with a further 10% saying it only happened once a week. So what is the value in eating together as a family? As children get older and busier, it becomes logistically more and more difficult to get everyone together at the same place at the same time to eat the same thing. And does it really matter? Eating together as a family affects what children consume - an interesting study found a direct correlation between how often children had meals together with their family and how many of their '5 a day' they ate. Family meals reduce the risk of obesity - I was fascinated to read registered dietitian Leslie Beck's summary of a new study published in the Journal of Pediatrics which found that teenagers who frequently ate with their families were less likely to be obese in later life. 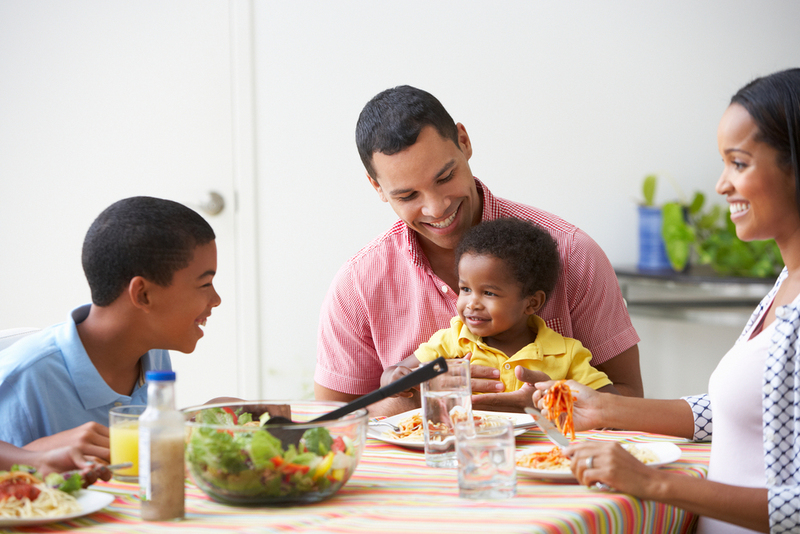 Family meals are valuable opportunities for children to learn social skills like listening, turn-taking and empathy. Catherine Lee, in her well respected book The Growth and Development of Children, writes: "Meals are more than eating: they are social occasions, an important part of the civilisation in which the child is developing"
I love this quote - for me it sums up what food is all about, especially in relation to children. I understand that for many families, a daily evening meal with Mum, Dad and 2.4 children is just not how things are. When I say 'family meal' I mean everyone in the household getting together for meals whenever possible, whatever the family configuration. If you are a single parent, for example, just taking the time to have breakfast with your child constitutes a family meal. This isn't about Sunday roasts and formal dining, just getting together around a table whenever possible, however possible. Almost every family could tweak their schedule in one way or another to squeeze more communal eating experiences into their week - I know this is true for my family. So do what you can with the time and resources that you have, and remember that small changes can have powerful consequences.